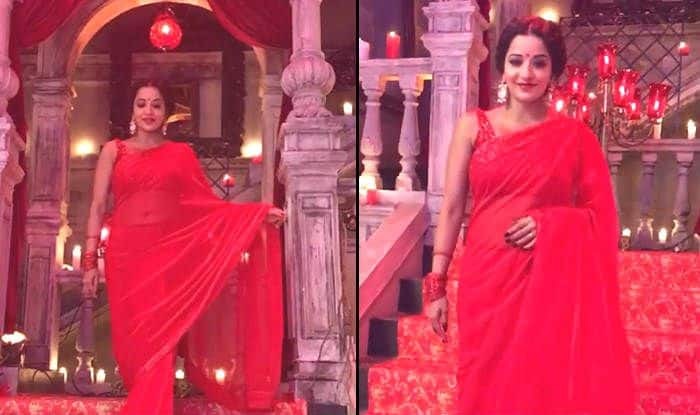 Monalisa has posted a new video on Instagram in which she is seen wearing a hot red saree. Bhojpuri sensation and TV actress Monalisa has shared a new social media post. It’s a video clip from the sets of her TV show Divya Drishti. Dressed in a striking red saree, Monalisa can be seen walking down the stairs flapping her saree pallu. The actress looks radiant wearing that stunning colour. A matching stack of bangles, a pair of statement earrings and her signature curly hair finish her look. The clip shows her decked up in her popular Mohana avatar. The actress captioned the clip and wrote, “ … Sometimes It Is Best Just To Walk Away In Silence … #mohana #divyadrishti #tonight on @starplus at 7pm” (sic). The other recent pictures of Monalisa has her posing beautifully wearing some gorgeous pieces of western dresses. In one picture, she is seen donning a green sensuous gown. On the work front, Monalisa is playing the lead in Nazar, a supernatural show in which she is essaying the character of a daayan or witch. Currently, she is shooting for the channel’s new supernatural show Divya Drishti. Monalisa will soon be seen making a special appearance on the show.